Americans for Tax Reform commemorated the occasion by publishing a few fun facts about the income tax. Among other interesting statistics, the initial top tax bracket was only 7 percent, and it didn’t kick in until income reached a whopping $11.6 million in 2013 dollars. Only 358,000 people had to fill out 1040 forms at first, because the standard family deduction was an adjusted $93,000. 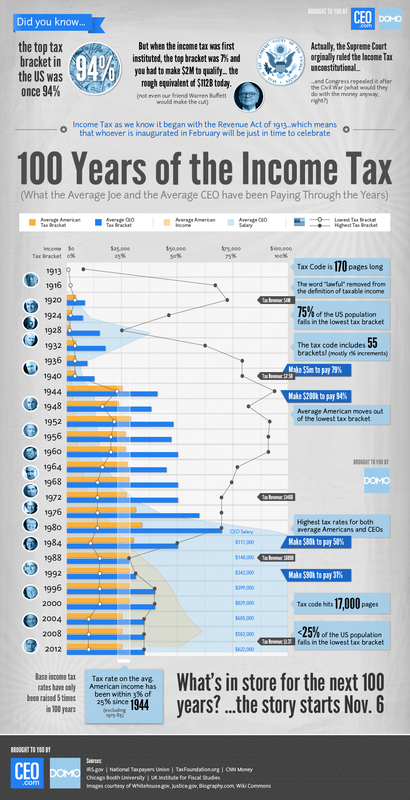 Over the past hundred years, the tax code has swelled from 400 pages to almost 74,000. The top rate is 39.6 percent; add in state and local taxes, and you’ve got the government soaking up over half of every marginal dollar earned by the Evil Rich. And the top bracket crashes down on those who earn over $450k, which is the new functional definition of a “millionaire.” Every new tax – from the income tax itself, to the Alternative Minimum Tax and its prospective stepchild, the “Buffett Rule” – is sold as a small levy on the vast wealth of millionaires. The AMT was only supposed to affect a couple of hundred people when it was implemented in 1969, but now it’s on the verge of grabbing 50 million taxpayers, if it’s not “fixed.” In the early years of the income tax, Americans were likewise assured that it would only slip a few dollars from the bulging wallets of the wealthy. Allowing the government to sink its feeding tubes into the veins of American income has fueled astonishing government growth. That first itty bitty tax levy brought in a paltry $16.6 billion in revenue, adjusted for the past century of inflation. Today the income tax brings in $2.7 trillion. Government inevitably grows to fill, and exceed, the space made available for it. Perhaps the biggest problem with this tax is the way it is collected. As we were all reminded during the row over presidential candidate Mitt Romney’s remarks about the “47 percent,” the “progressive” tax system has moved an increasingly large cohort of Americans out of the system entirely, while placing an ever-greater share of the burden upon a dwindling group of high wage earners. Remarkably, this group is perpetually accused of “greed” and refusing to pay its “fair share,” even though the relationship between its tax burden and the amount of income it earns has long since exceeded any reasonable definition of “fairness.” Even before the new Obama tax increases kicked in, the Heritage Foundation noted that the top 10 percent of income earners were carrying 71 percent of the federal income tax burden, even though they earned only 43 percent of all income. The bottom 50 percent, meanwhile, earned 13 percent of all income but paid only 2 percent of the income tax.